The West is known for summer wildfires. Now it seems Western summers will be distinguished by another kind of flare-up: algae blooms. This summer has witnessed an explosion of algae problems in Western water bodies. Usually marked by a bright green mat of floating scum, the blooms are unsightly and unpleasant for water lovers. More concerning are potentially toxic cyanobacteria often produced by the algae, which can be deadly to pets and livestock and cause illnesses in people. These harmful algal blooms have popped up in freshwater lakes and streams for years. But in recent years they seem bigger and more widespread than ever, resulting in closed beaches, public health warnings and risks to drinking water in a few locations. Blooms are even popping up in unlikely places, such as high-elevation mountain lakes. But there is currently no federal drinking water standard for algal toxins and in many places, data monitoring of blooms is still scarce. While the cause of each incident is not always known, two of the main known drivers of algal blooms are excess nutrients in the water and extreme heat. As a result, algae-coated lakes could become one of the most visible consequences of rising global temperatures. The most serious incident recently occurred in May in Salem, Oregon, where a health advisory was issued to more than 200,000 customers of the city water department following the detection of algal toxins in the drinking water supply. Young children, the elderly, pregnant women and people with certain medical conditions were warned not to drink tap water for most of the month of June. Salem officials still don’t know what caused the toxic bloom. The algae and the bacteria involved in harmful blooms are all naturally occurring and are important building blocks of all life on Earth. But the two main causes of the blooms are not natural. Erosion and excessive fertilizer are to blame for the high levels of nutrients. For the second factor, warm temperatures cause algae to bloom more aggressively and climate change seems a likely culprit. Scientists at Tufts University in Massachusetts published a study in 2017 predicting toxic algal blooms would increase as the climate warms. Algal blooms are unpredictable, typically resulting from a suite of biological and environmental conditions. Most algal toxins come from a class of cyanobacteria present with some – but not all – algae. So the mere presence of algae does not mean a toxin is present. The only way to detect algal toxins is through laboratory testing of water samples. This can take days, adding significant delay to any public health response. No one knows precisely how often blooms occur because there is no monitoring of the problem on a national scale. Cox, based in Ames, Iowa, and his team at EWG decided to gather their own data by recording how often algal blooms were mentioned in the news media. He admits this was a crude method, but no other data was available. In their resulting report, released in May, they documented 169 blooms in 2017 – up from 51 the year before. That is certainly a low estimate, because many blooms probably don’t get reported in the media. Case in point: in 2016, the SWRCB launched its own algal bloom reporting program. It is based entirely on volunteer reports. Even so, in 2017 it recorded 181 algal blooms just in California, an increase from 91 the year before. Of the 2017 blooms, 141 were serious enough to prompt health advisories. One of the 2017 reports illustrates how algal blooms are popping up where they once didn’t seem possible. On Sept. 8, a bright green lake-wide algal bloom was reported at Rim Rock Lake, a natural water body at the 7,000-feet (2,130 meters) elevation deep inside Lassen National Forest in Northern California. Water samples revealed four species of cyanobacteria, but none was producing toxins at the time. The United States Environmental Protection Agency (EPA) conducts a National Lakes Assessment every five years that sheds a little more light on the issue. The most recent assessment now dates back to 2012. It found cyanobacteria and microcystin, a key algal toxin, had increased 8.3 percent and 9.5 percent, respectively, in the nation’s lakes compared with 2007. In addition, the presence of phosphorus – a main nutrient from fertilizers that feeds algal blooms – also grew significantly worse. Eighteen percent of lakes showed increasing phosphorus concentrations compared with 2007. And 40 percent were recorded as having excess phosphorus. To close this gap, Loftin is helping develop a new national Cyanobacteria Assessment Network. He’s part of a team that includes the EPA, National Oceanic and Atmospheric Administration and NASA. They plan to use satellite sensors to detect and monitor harmful algal blooms nationwide. It will include a smartphone app to make the data widely available. The system is being tested now and Loftin hopes it will be publicly available within a year. Data produced by the system could help develop new algae management techniques and regulations. The EPA, the nation’s water-quality police, has only issued recommendations and has yet to impose federal drinking water standards for algal toxins. As a result, many utilities are forced to improvise when an algal bloom strikes. Such was the case during Salem’s recent crisis. The first indicator came on May 8, when an algal bloom appeared at Detroit Lake, a U.S. Army Corps of Engineers reservoir on the North Santiam River. Salem draws its drinking water from the reservoir, which is also popular for boating, swimming and fishing. Because it had experienced blooms before, Salem already had a weekly testing program for algal toxins. Now it increased testing to twice weekly, sending samples to a laboratory in Ohio. It wasn’t until May 25, just before Memorial Day weekend, that test results from a sample of the city’s water confirmed the presence of a type of cyanotoxin. Consulting with the Oregon Health Authority, the city took a wait-and-see approach to the problem over the long holiday weekend, Goeres-Priest said. It tweaked the water treatment process to try to control the toxin, and tapped a backup supply from the neighboring city of Keizer to help dilute the water. But the bloom continued. So on Tuesday, May 29, the city issued a health advisory urging sensitive groups not to drink the tap water. It affected not just Salem, but three neighboring communities that draw water from the city. With help from the state, Salem began distributing bottled water and the National Guard mobilized tankers to dispense clean water at two dozen sites for residents who brought their own containers. The city lifted the health advisory five days later, on June 2, after two consecutive days of clean water samples. Then the bloom roared back, and on June 6 Salem was forced to impose the advisory again, adding to public confusion. It was finally lifted on July 3, only after 12 consecutive days of clean water tests. Algal blooms had struck Detroit Lake before, but none had ever lasted that long or required health warnings. A forest fire may be one new contributor. The Whitewater Fire, which started in July 2017, burned 14,000 acres of forest in the Santiam River watershed east of Salem. Fire ash contains phosphorus, a nutrient that could have fed this year’s algal bloom. Goeres-Priest doesn’t know to what extent that was a factor. The algal bloom episode was costly for Salem, she said, although a full tally is not yet available. Initially, the city spent hundreds of thousands of dollars on water sample testing. Later, to avoid the delay of sending samples to Ohio, the city bought its own testing machine at a cost of $35,000. It also bought a cryofreezer because laboratory protocol requires samples to be flash-frozen and thawed three times before testing. Salem also had to upgrade its water treatment plant, adding a process involving powdered activated carbon to remove algal toxins from the source water. In response to Salem’s travails, the Oregon Health Authority imposed its own interim water quality standards for algal toxins. It now requires all water agencies to test for them regularly while it develops permanent standards. One thing that’s clear about toxic algal blooms is that treating the outbreak doesn’t solve the problem. They are likely to recur until the root cause is corrected. Watsonville, California, provides an example. 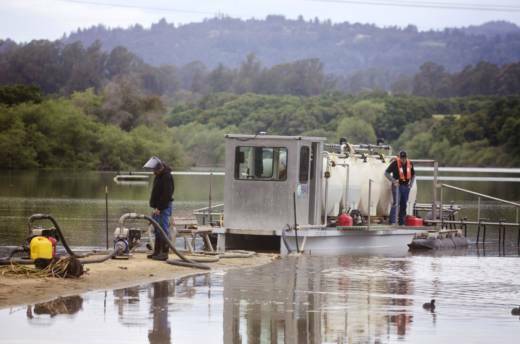 Pinto Lake, a Watsonville city recreation site, began experiencing algal blooms as early as the 1980s, said Jackie McCloud, the city’s environmental projects manager. The lake drains into the Pajaro River, then into Monterey Bay. The blooms were not a drinking water concern, because the lake isn’t used for that purpose. But the algae problem became unavoidable when sea otters, protected by the state and federal Endangered Species Act, began turning up dead on the bay shore in 2007. Necropsies cited liver failure as cause of death in 33 sea otters. That, in turn was caused by exposure to microcystin, an algal toxin that accumulated in the tissues of sea urchins and shellfish eaten by the otters. It was the first time the freshwater toxin had been documented to survive in seawater and cause the death of marine mammals. The toxin was traced upstream to Pinto Lake. McCloud said the lake’s algae problem dates back to the earliest days of settlement in the area. Vast redwood forests in the coastal mountains draining into the watershed were cut down for building materials, and the resulting erosion coated the bottom of the lake with nutrients – specifically phosphorus. Farming, road building and housing development sent more phosphorus-laden runoff into the lake. “We were just seeing massive amounts of erosion from the watershed coming into the lake,” McCloud said. The city took a two-pronged approach: stop the algal blooms and stop the erosion. To control the blooms, the city hired a consultant who applied alum, a chemical compound meant to neutralize and isolate phosphorus in the lakebed. McCloud called this a “Band-Aid” measure because the real solution lies in the watershed upstream. But the city has no land use authority in the watershed, so it began working with Santa Cruz County and the local Resource Conservation District, an organization that helps farmers improve land use practices. Landowners were encouraged to adopt erosion control measures, such as water bars on dirt roads to manage runoff and buffer strips of vegetation to capture it. The county adopted similar measures on its public lands in the watershed, including Mt. Madonna County Park. All this work, including the alum treatment, was funded by $900,000 in EPA grants administered by the SWRCB. McCloud called it a success: there have been no algal blooms since the work began. But she knows the job isn’t done. The alum treatment will eventually wear off, and erosion controls require ongoing maintenance.